Liaquat National Hospital & Medical College Karachi Sindh. Qualification & Experience: MBA (Supply Chain Management) /MPA or equivalent qualification with at least 10-F years related experience at a successively higher level of responsibility including at least past 3. years at a managerial level. Related experience in a healthcare organization or with handling pharmaceuticals will be an advantage. Job Summary: Incumbent should be proficient in the use of MS Office and be able to work in AS/400 system/ERP modules preferably Oracle EBS. Manager. Inventory-will report to Financial Controller and will be responsible to manage the inventory of all consumables, medicines. injections and other healthcare -supplies and fixed assets of the institution, and will ensure required ongoing reporting, and facilitation for periodic audits. Qualification & Experience: Masters degree in Computer Science or equivalent from a reputable institute. The candidate must have a minimum experience of 10 years in software-development including 6 to 7 years in Oracle EBS. Job Summary: We are looking for highly skilled: and motivated individual who can manage and deliver large and complex ERP engagements to identify, design, and implement creative business and technology solutions for the hospital. 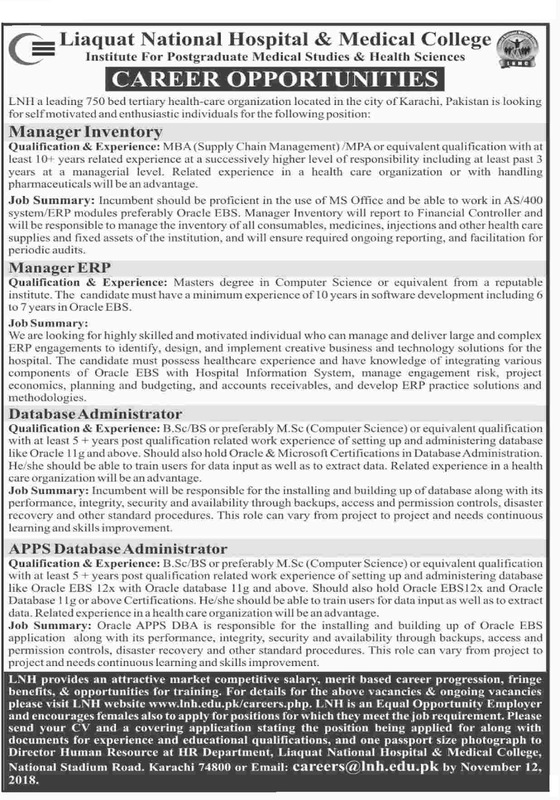 The candidate must possess healthcare experience and have knowledge of integrating various components of Oracle EBS with Hospital Information System, manage engagement risk, project economics, planning and budgeting, and accounts receivables, and develop ERP practice solutions and Methodologies. Qualification & -Experience: B.Se/13$ or preferably M.Sc (Computer Science) or equivalent qualification with at least 5 + years post qualification related work experience of setting up and administering databases like Oracle 11g and above. Should also hold Oracle & Microsoft Certifications in DatabaseAdministration. He/she should be able to train users for data input as well as to extract data. Related experience in a healthcare organization will be an advantage. Job Summary: Incumbent will be responsible for the installing and building-up-of database along-with. its performance, integrity, security and availability through backups, access and permission controls. disaster recovery and other standard procedures. This role can vary from project to project and needs continuous learning and skills improvement. Qualification & Experience: B.ScIBS or preferably MSc (Computer Science) or equivalent qualification with at least 5 years post qualification related work experience Of setting up and administering database like Oracle EBS 12x with Oracle Database 11g and above. Should also hold Oracle EBS 12x and Oracle Database 11g or above-Certifications. He/she should be able to train users for data input as well as to extract data. Related experience in a health-care organization will be an advantage. Job. Summary: Oracle APPS DIM is responsible for the installing and building up of Oracle EBS application -along with its performance, integrity, security and availability through backups, access and permission controls, disaster recovery and other standard procedures. This role can vary from project to project and needs continuous learning and skills improvement. LNH provides an attractive market competitive salary, merit-based career progression. fringe benefits, & opportunities for training. For details for the above vacancies & ongoing vacancies please visit LNH website: www.lnh.edu.pk. LNH is an Equal Opportunity Employer and encourages females also to apply for positions for which they meet the job requirement. Please send your CV and a covering application stating the position being applied for along with documents for experience and educational qualifications, and one passport size photograph to Director Human Resource at HR Department, Liaquat National Hospital & Medical College; National Stadium Road. Karachi 74800 or Email: careers@lnh.edu.pk by November 12, 2018.